Microsoft PowerPoint or OpenOffice.draw (part of the freeware package OpenOffice.org, available from www.openoffice.org) can be used to draw boxes and arrows and add annotations. EmergySystems.org hosts a set of symbols that can be used in such diagrams to characterize a range of systems properties. The symbols were proposed by Odum, H.T. 1994. Ecological and General Systems: An Introduction to Systems Ecology. University Press of Colorado. They can be copied from: http://www.emergysystems.org/symbols.php. The commercial modeling software STELLA enables conceptual models to be made using a simple set of icons for state variables, fluxes, parameters and information flow. It is marketed by isee systems, at www.iseesystems.com. STELLA can be used without adding the quantitative equations required to make the model work. We found the freeware Cmap to be especially useful at this stage. As the example in the Figure further down this page shows shows, Cmap's boxes can be used to represent system 'nouns' or things, and its linking arrows, 'verbs' or relationships. Cmap is obtainable from: IHMC Cmap Tools: http://cmap.ihmc.us. The second action point concerns drawing one or more conceptual models. The example demonstrates several general points. A box has been drawn to include the main components and relationships of the ecosystem relevant to the Issue. Within this the component labelled 'balance of organisms', included to take account of a key feature of eutrophication, may become superfluous in the final model, if this need only include components that relate to the costs and benefits of nutrient removal by way of water transparency. Several arrows cross the left-hand side of the ecological box, and these represent the boundary fluxes (the 'external inputs'). All are relevant to the issue, but the arrows for discharges and leaching are directly involved in the Human Activity-forcing link, whereas the arrow for exchange represents a natural process that continues irrespective of the HAs but is essential to quantifying the effect of the human forcing. The diagram includes key social and economic features of the coastal zone system as related to the locally defined Issue of eutrophication. There is a feedback loop from water transparency by way of Environment Managers to control of nutrient discharges. The managers, plus householders and farmers, are parts of the socio-economic system within the boundaries of the conceptual model. Whereas the ecosystem model is very likely to become a mathematical model, this may not be true of the socio-economic components. But these have to be understood to make sense of system behaviour. The local income resulting from visitors is in our example one of the agreed management indicators (and thus a an output from the Virtual System), so it will be necessary at some stage to have a means to estimate this as a function of simulated changes in transparency. Finally, the two EC directives mentioned here may be treated as boundary conditions for governance: they influence what happens in the 'virtual machine' but are not influenced by it. Figure 1: Example conceptual model, based on eutrophication as an Issue. This example uses Cmap Tools to show ideas about the contents and causal relationships of the Virtual system as they might emerge from a preliminary discussion; it is not yet a full specification for the mathematical model, although suggests that 'nutrients' and 'transparency' might become state variables in this model. An attempt has been made to distinguish actual flows of nutrients (thicker lines) from less well-defined cause-effect relationships or information flows. Cmap allows a hierarchy to be set up within the conceptual model, with complex low-level objects collapsing into simpler objects when viewed at a high level. The tab on the 'phytoplankton' box indicates that it can be expanded in this way, to show a subsystem dealing with the effect of light and nutrients on micro-algal growth. Remember that the SAF started and will finish with stakeholders and environment managers. Thus, although the task of making a conceptual model - of formalizing understanding or hypotheses about system function - is engrossing for scientists, the purpose of the modeling work is to return some information to stakeholders. So, keep clearly in mind what the virtual machine is supposed to make or indicate! To take eutrophication as an example problem, then it is likely that you will want the numerical model to simulate changes in the amount of phytoplankton and water transparency - in response to external changes, such as the seasons of boundary conditions, in response to hazardous events, and in response to changes in management - and perhaps also the economic costs associated with this. Some stakeholders' goals might be minimization of the costs of collecting and treating urban waste water, others might be maximization of the benefits (jobs and income) from visitors attracted by clear seawater and unpolluted beaches. 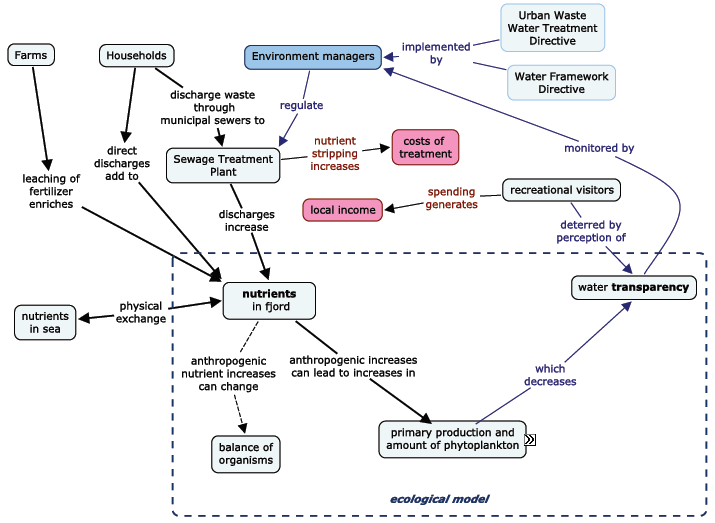 It is these things that are the outputs of the modelled systems, and so the conceptual model should clearly show how these socioeconomic things link to the account of the relevant ecosystem processes, even if they don't get into the final numerical model. Identify the model variables that might be used for model testing. Identify the Virtual System variables that might be used to demonstrate reliable sithe coastal during 'System Appraisal be time ser or rates, tompared withs. Specify the uts for both and quantitative analyses. Ensure that the conceptual modelarker(s) for the informati tion model(s), corresponding to or leading to the indicators used to evaluate the effects of various scenarios in the 'System Appraisal' and 'System Output' steps.